When you press the ... button on the Template parameter, you enter the Template Editor Dialog. 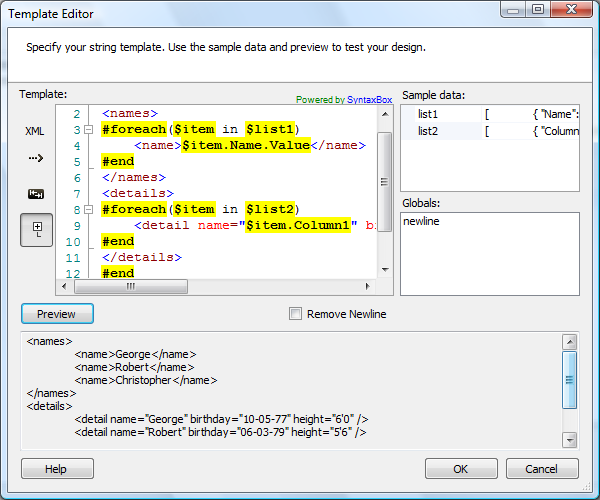 The dialog contains a syntax-highlighting editor, a list box for definition of sample test data, a list of global macros available for drag-and-drop and a preview window. Sample data - Specify template sample data. Each template parameter sample can be individually specified. The input can be either simple or JSON format input. Use JSON format for simulating complex structures. The sample data doesn't participate in the generation process. It is included only for testing your templates. Globals - Select and drag-and-drop a global macro to your template definition. You can implement your own global macros by including it in the VM_global_library.vm file. The file is located in the SSIS+ installation folder, under the VTL sub-folder. Remove Newline - Use this parameter to remove carriage return / line feed characters. Certain text documents like EDI do not expect to find new line characters in the output. However, new lines can be used to make template definition more readable. Having this parameter allows you to continue to use new lines for readability, without affecting template generation. Use the General page of the Template Task Editor dialog to configure the parameters needed to generate your text document. Indicate whether or not the template layout is stored in a file. This parameter has the options listed in the following table. True The template layout is stored in a file. Selecting this option displays the dynamic parameter TemplateFile. False The template layout is directly specified. Selecting this option displays the dynamic parameter Template. Specify the text template. For more information about template design, see Template Editor. Specify the template input encoding. For reference check the .NET Encoding.GetEncodings method. Specify the result encoding. For reference check .NET Encoding.GetEncodings method. Indicate whether or not the result file is stored in a variable. This parameter has the options listed in the following table. True The result file is stored in a variable. Selecting this option displays the dynamic parameter ResultVariable. False The result file is specified in a File connection manager. Selecting this option displays the dynamic parameter Result. Contains the result file path or output Stream object. Select an existing user-defined variable, or click <New variable...> to create a new variable. The list of parameters category is dynamically constructed based on your template design. For each template parameter, the task dialog will construct a pair of parameter source type and source type specific parameter selection. Specify parameter source type. This parameter has the options listed in the following table. FileConnection The parameter source is file connection. Selecting this option displays the dynamic parameter [parameter]File. Variable The parameter source is a variable. Selecting this option displays the dynamic parameter [parameter]Variable. Destination The parameter source is a data flow destination. Selecting this option displays the dynamic parameter [parameter]Destination. Type the data flow destination (DataReader Destination), or click the browse button (...) and locate it. Where can I find the documentation for the Template Task? New: Support for activation of template helper classes. Fixed: Failed to generate result from data flow parameter in certain situations (Thank you, Federico). New: Support for loading of template layout from file connection manager. Fixed: Task now provides more diagnostic information during the generation process.